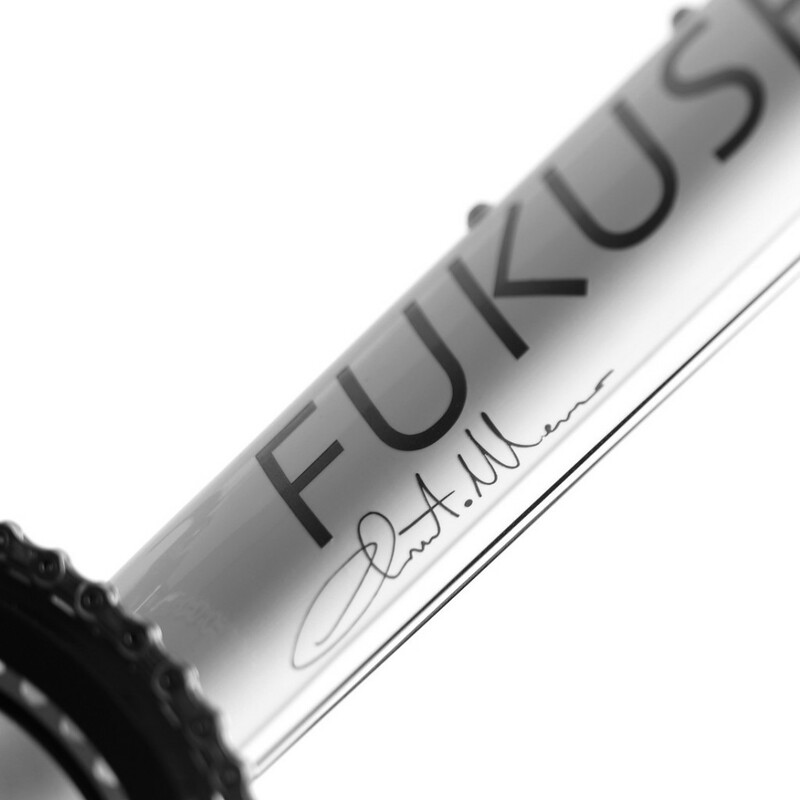 In partnership with designer Marco Chiurato we developed Fukushima 131. 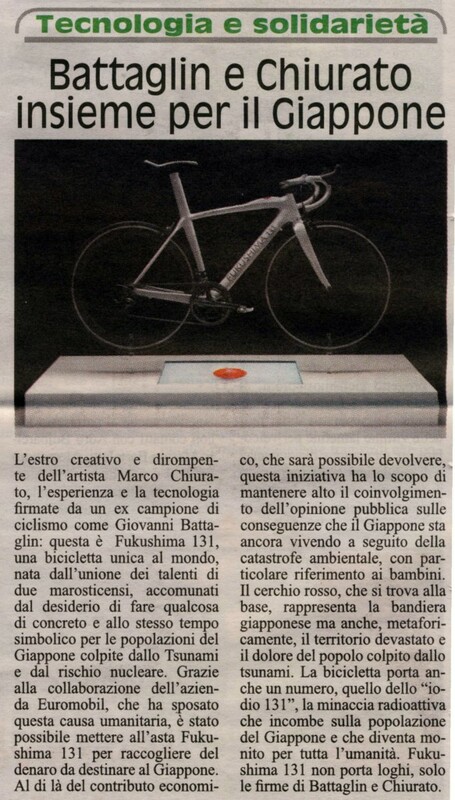 This unique bicycle is on display in Milan and will be auctioned off to raise money for the people in Japan. 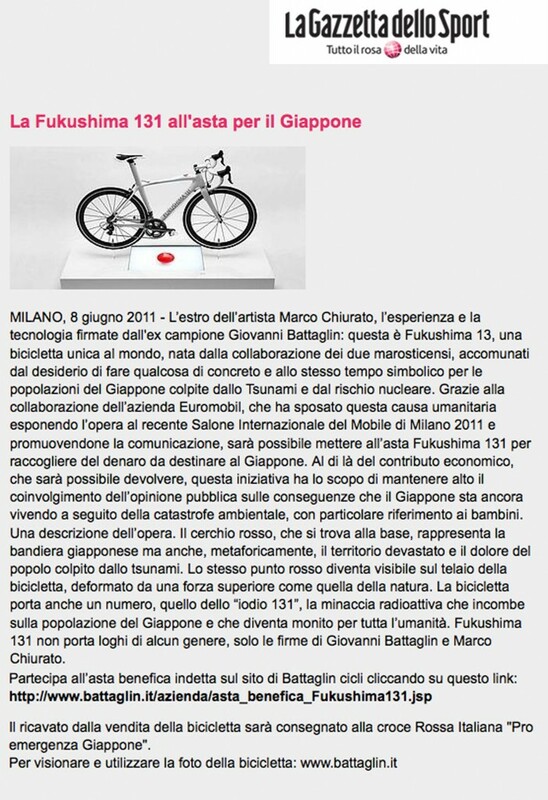 The creative inspiration of Marco Chiurato and the constructive expertise and technology of Giovanni Battaglin, Fukushima 131 is a unique bicycle, created through a combination of the talents of two men from Marostica who share the same desire to do something concrete and also symbolic for Japan.This exclusive piece will be on display, until Sunday the 17th of April, in the Dèsirèe/Zalf-Gruppo Euromobil area – pavilion 10 stand C15/D18 – at the Milan Rho International Furniture Show. A disastrous event like a tsunami can disrupt the life of a people. However, the survival instinct prevails even such adversities, no matter great the fear and panic. Once again the bicycle becomes salvation as a means of escape from a traumatic and shocking reality.A headlong rush to find a safe haven starts, to stay alive.The red circle at the bottom represents the Japanese flag but also, metaphorically, the devastated territory and the suffering of a people struck by the tsunami. 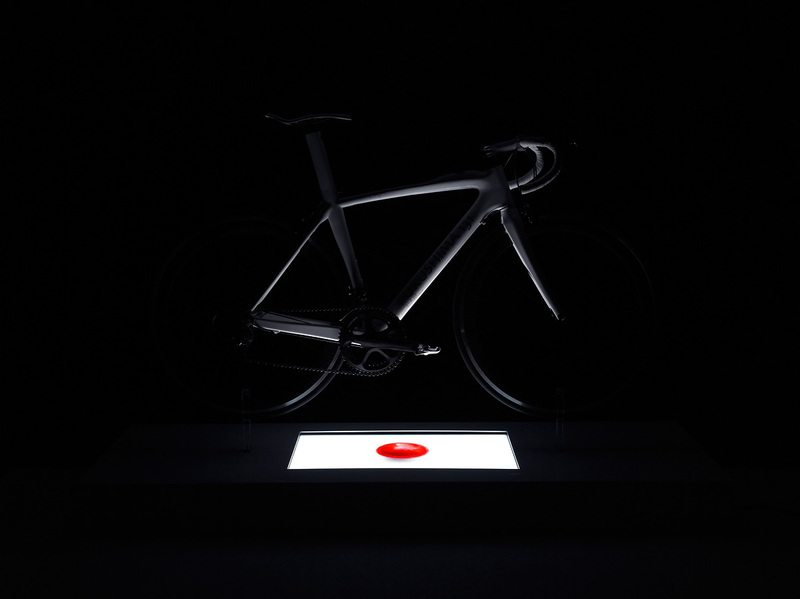 The same red dot becomes visible on the bicycle frame, deformed by a greater force like that of nature. 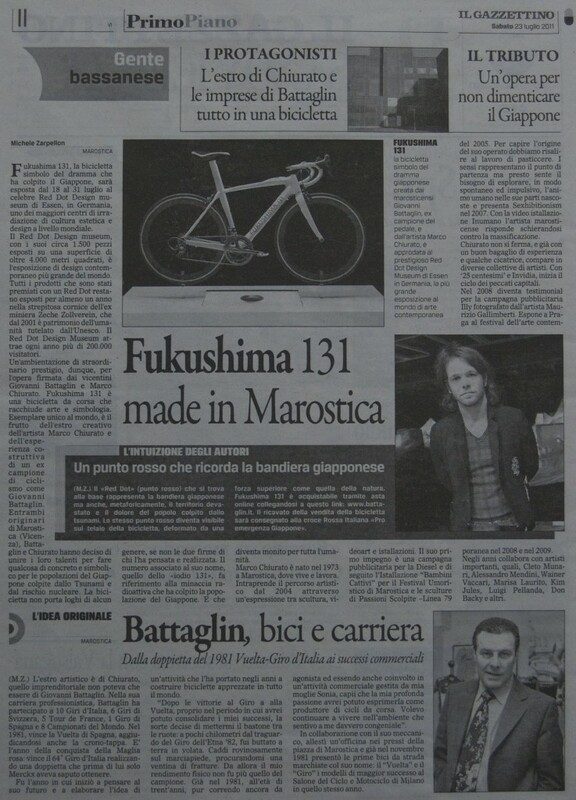 The bicycle also bears a number, and namely that of Iodine-131, the radioactive matter threatening the population of Japan. 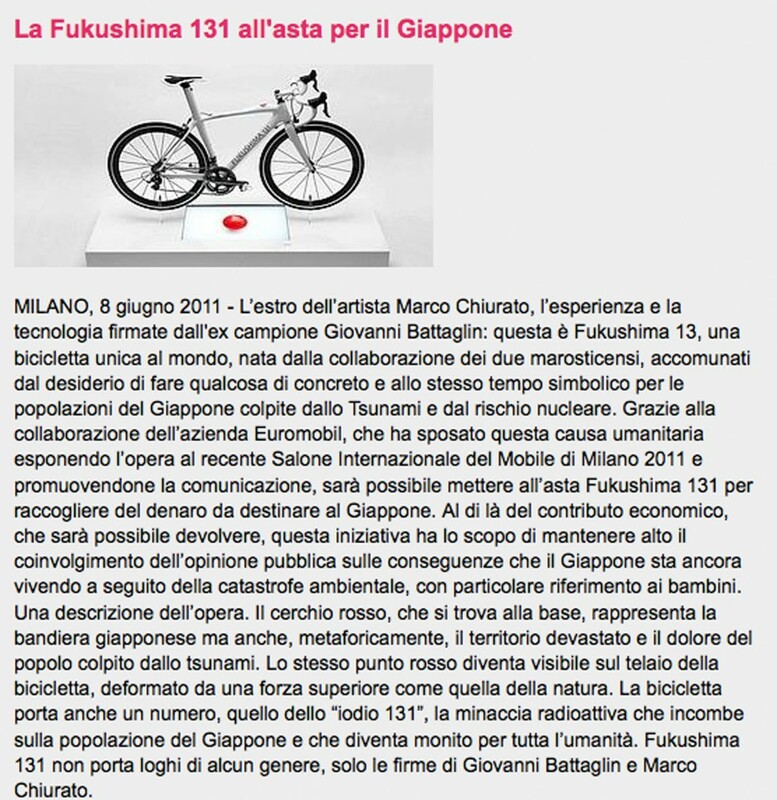 And which becomes a warning for all mankind.Fukushima 131 does not bear any kind of logo, but only the signatures of Marco Chiurato and Giovanni Battaglin, who wanted to auction their work in order to obtain funds to go to the Japanese cause. Die kreative und explosive Inspiration von Marco Chiurato, die Erfahrung in der Herstellung und Technologie von Giovanni Battaglin. Fukushima 131 ist ein einzigartiges Rad auf der Welt, geboren durch die Vereinigung von zwei Talente aus Marostica, die gemeinsam den Wunsch hatten, etwas Konkretes und zur gleichen Zeit Symbolisches für Japan zu tun.Dieses einzigartige Stück ist noch bis Sonntag, 17. APRIL in der Austellung der Desirèe / ZALF-Group-Euromobil Halle 10 Stand C15/D18- im Salone Internazionale del Mobile di Milano Rho (Internationale Moebelmesse in Mailand) zu sehen.Ein katastrophales Ereignis wie der Tsunami hat die Macht, das Leben eines Volkes zu zerstören.Aber auch in solch widrigen Situationen wird der Instinkt des Überlebens, wie groß die Angst und Panik auch ist, überwaeltigt. Das Rad wird ein Rettungsanker, ein Mittel zur Flucht aus einer traumatischen und schockierenden Realität. Es beginnt eine Flucht um einen sicheren Hafen zu finden, um am Leben zu bleiben.Der rote Kreis, der sich an der Basis befindet, stellt die japanische Flagge, aber auch, metaphorisch, das verwüstete Gebiet und den Schmerz der Menschen, die durch den Tsunami betroffen sind, dar. Der gleiche rote Punkt wird auf dem Rahmen des Rads sichtbar, deformiert durch eine höhere Gewalt der Natur. Das Rad trägt auch eine Nummer, die vom Jod 131, die radioaktive Gefahr, die über der Bevölkerung von Japan drohend schwebt und die eine Warnung für die ganze Menschheit wird.Fukushima 131 trägt keine Logos jeglicher Art, nur die Unterschriften von Marco Chiurato und Giovanni Battaglin, die dieses „Stück“ versteigern wollen um einen finanziellen Beitrag zu sammeln für die Opfer in Japan. 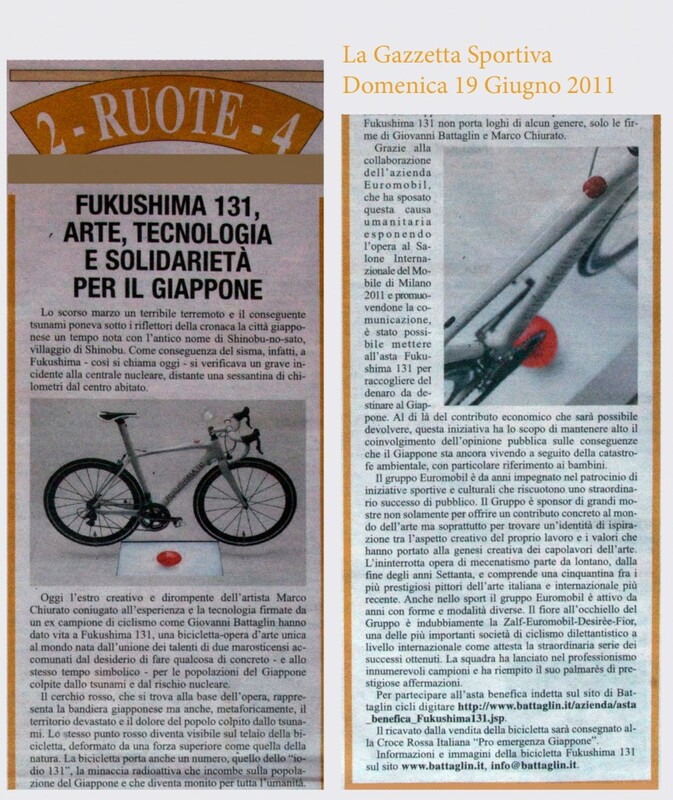 L’estro creativo e dirompente dell’artista Marco Chiurato, l’esperienza e la tecnologia firmate da un ex campione di ciclismo come Giovanni Battaglin: questa è Fukushima 131, una bicicletta unica al mondo, nata dall’unione dei talenti di due marosticensi, accomunati dal desiderio di fare qualcosa di concreto e allo stesso tempo simbolico per le popolazioni del Giappone colpite dallo Tsunami e dal rischio nucleare.Grazie alla collaborazione dell’azienda Euromobil, che ha sposato questa causa umanitaria, è stato possibile mettere all’asta Fukushima 131 per raccogliere del denaro da destinare al Giappone. Al di là del contributo economico, che sarà possibile devolvere, questa iniziativa ha lo scopo di mantenere alto il coinvolgimento dell’opinione pubblica sulle conseguenze che il Giappone sta ancora vivendo a seguito della catastrofe ambientale, con particolare riferimento ai bambini. Il ricavato dalla vendita della bicicletta sarà consegnato alla croce Rossa Italiana “Pro emergenza Giappone”. Muy interesante esta idea. Se crea una bici única, objeto de coleccionista y se subasta para recaudar fondos para ayudar a Japón. 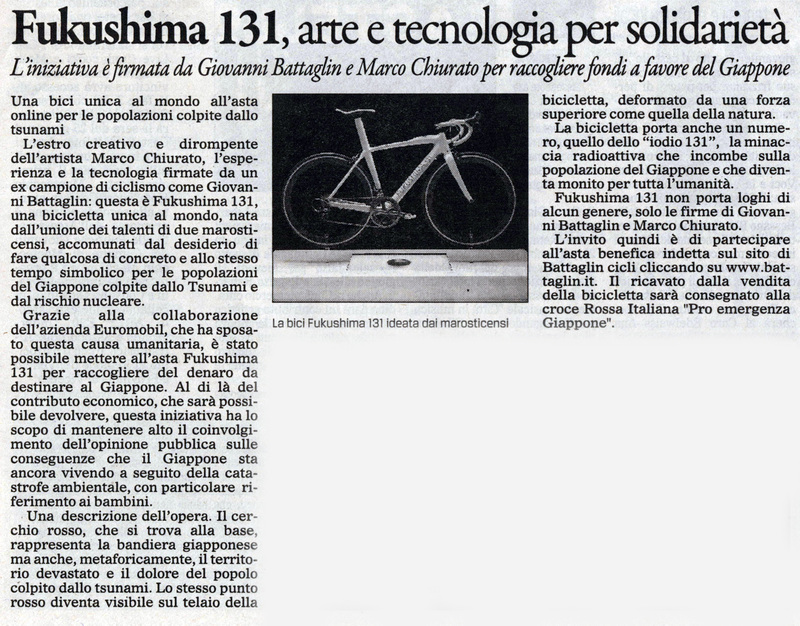 Esto es lo que están haciendo el artista Marco Chiurato y el gran ex-campeón y constructor Giovanni Battaglin al crear la “Fukushima 131″, una máquina muy especial, con un diseño pensado para recordar los trágicos sucesos que acaecieron al país nipón el 9 de marzo de 2011.Como ejemplo de esto, la bandera japonesa está pintada en un relieve del cuadro que simboliza la fuerza de la naturaleza, y el nombre “Fukushima 131″ hace referencia al Yodo 131, la terrible sustancia radiactiva que ha obligado a evacuar un radio de 40 km alrededor de la central nuclear japonesa que ha sufrido las peores consecuencias del terremoto y posterior tsunami. 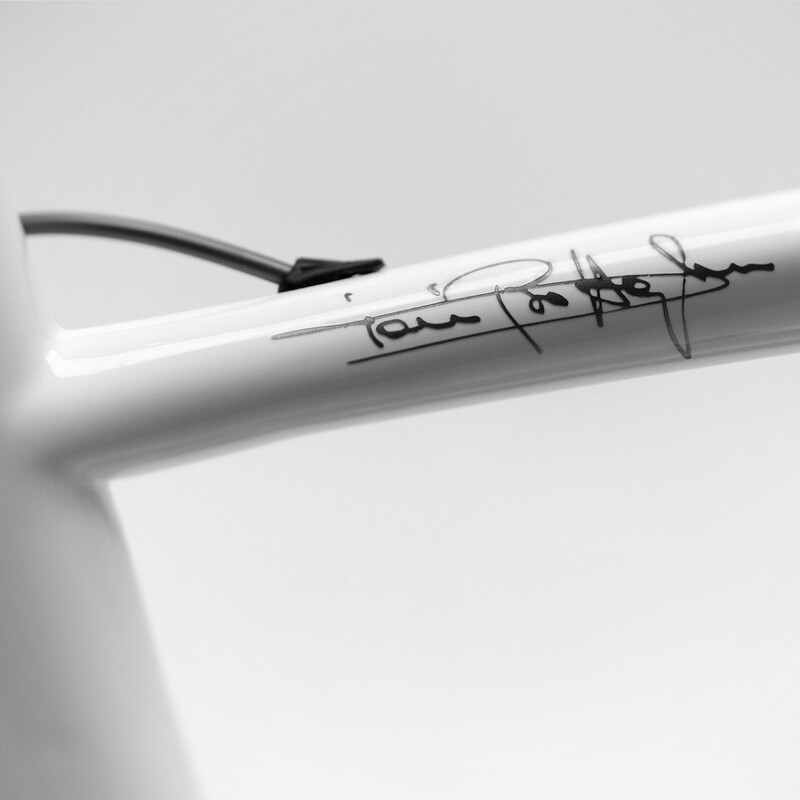 La bici no lleva ninguna marca comercial, salvo las firmas de sus dos creadores, Battaglin y Chiurato y el nombre que sirve de homenaje y recuerdo a las víctimas de Japón. 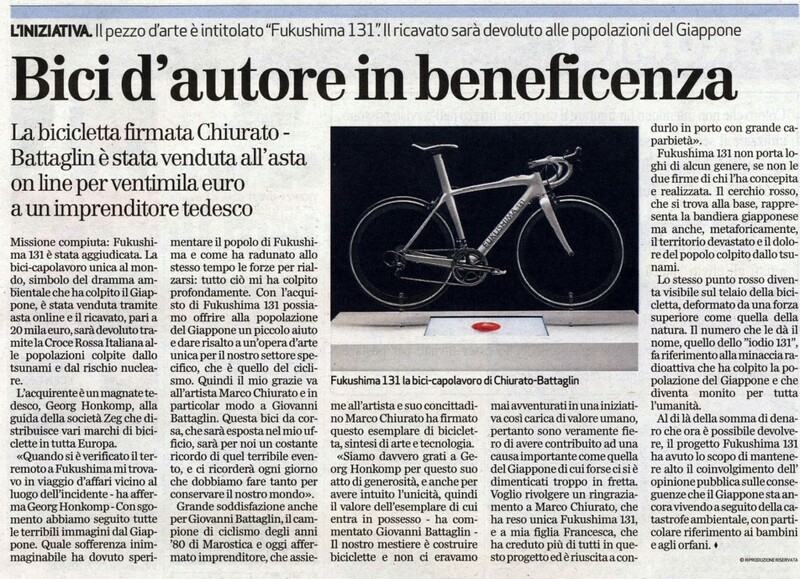 El producto de la venta irá destinado a la Cruz Roja Italiana, en su programa especial “Pro emmergenza Giappone”. A unique bicycle up for auction online for the population struck by the tsunami. The highly creative inspiration of artist Marco Chiurato, and the experience and technology offered by former cycling champion Giovanni Battaglin. Fukushima 131 is a truly unique bicycle resulting from a combination of the talents of two men from Marostica, both sharing the same desire to do something concrete but also symbolic for the people of Japan struck by the tsunami and the nuclear risk.Thanks to the collaboration of the Euromobil firm, which backed this humanitarian cause by displaying the work at the 2011 Milan International Furniture Show and making it known, it will be possible to put the Fukushima 131 up for auction in order to raise funds for Japan. Apart from the financial contribution made possible, the purpose of this initiative is to keep public opinion well-aware of the consequences Japan is still suffering as a result of the environmental disaster, with particular reference to the children.Fukushima 131 does not bear any kind of logo, but only the signatures of Giovanni Battaglin and Marco Chiurato.The proceeds from the sale of the bicycle will go to the Italian Red Cross “Pro emergenza Giappone”. Der Erlös der Versteigerung des Rennrads geht an das Rote Kreuz (Croce rossa Italiana) »Notfall Pro Japan«. sulle coste inerti del Pacifico. Lesto ti alzi sui pedali, rapito dall’istinto primitivo. contro la terra scoscesa e ferita. dal mortale e inatteso pericolo: 131i. 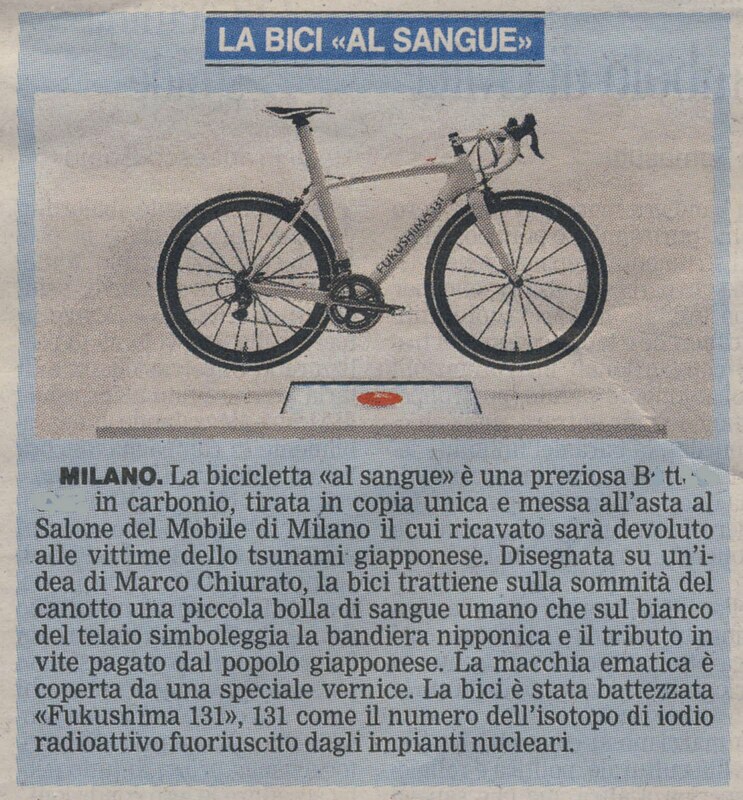 il sangue di un popolo, la realtà riedificata. against lost coasts of the Pacific. 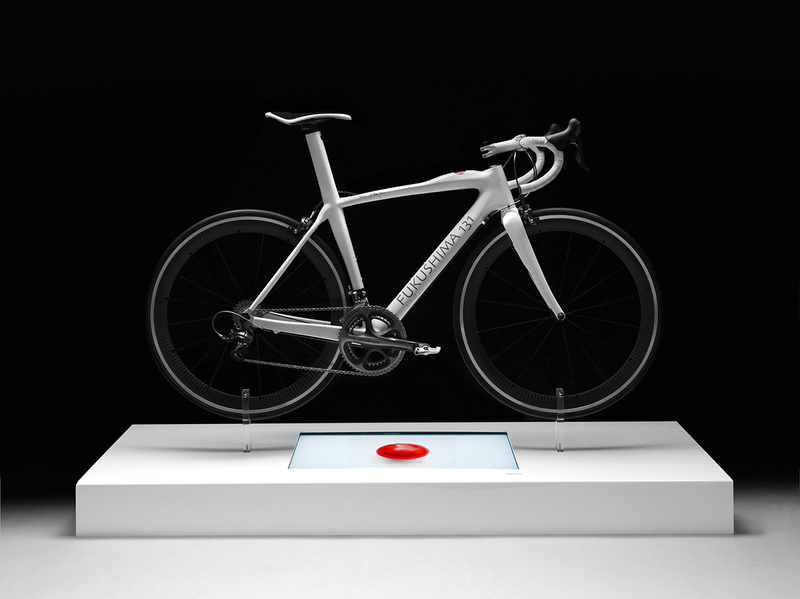 You stand up quikly on the pedals, abducted by primitive instinct. against the abrupt and hurted eath. from lethal and unexpected danger: 131i. blood of a nation, a rebuilt reality. Non potevamo rimanere indifferenti, ci ha colpito! E” un grande paese amico. Fa parte del nostro percorso di uomini e di azienda fermarci un momento e riflettere, anche un piccolo gesto in un mare di tragedia può significare l”aiuto alla ripresa.